Gears of War, computer game that blends tactical action with survival horror, thrusts gamers into a deep and harrowing tale of humankind's epic battle for survival against the Locust Horde, a nightmarish race of creatures that surface from the bowels of the planet. 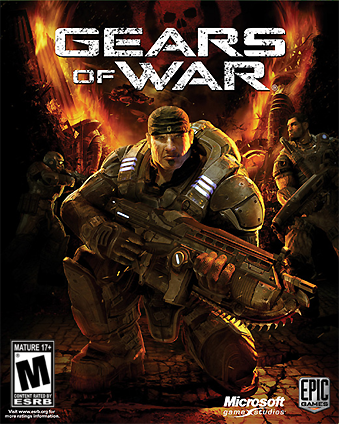 The storyline plays out like a Hollywood blockbuster -- lead character Marcus Fenix pits advanced human technology against the overwhelming Locust Horde. Built around a revolutionary third-person tactical combat system and breathtaking, high-definition visuals from the Unreal Engine 3, Gears of War immerses you in a horrifying tale of war and survival. Slam you into cover. As you approach cover in GOW simply tap the A button to slide and make immediate use of cover. Vault you over the cover. Once you're in cover, pressing up and A will vault you over your cover to engage the opponent or next cover opportunity. Evade enemy fire. When you're forced to be out in the open, tapping the A button will engage a roll maneuver to evade enemy fire. Activate a "Swat Turn." When taking cover on the side of a doorway, pressing the A button will spin your character from one side of the doorway to the other, helping avoid fire. If you need more information please contact the developers of Gears of War (Microsoft Studios), or check out their product website.